Brief Description of Subject: At the top of the canopy is a four sided figure in the shape of a cross. 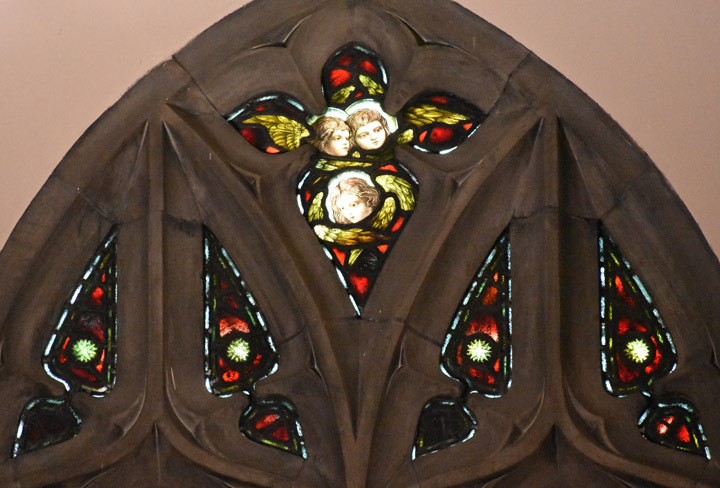 In the center are three cherubs. The story of the "Presentation of Christ" is covered in Luke 2:22-38. By Jewish law a woman is unclean after child birth and must be purified. If the child is a first born male he must be redeemed from God. The ceremonies take place in the Temple forty days after birth, payment for the ceremony is a lamb or if the parents can't afford it, two doves can be substituted. When the first family came to the Temple at the stipulated time, a man named Simeon was there. He had been promised by the Holy Spirit that he would not die until he had seen the Messiah. When he saw Jesus he took him in his arms and proclaimed what is known as the Canticle of Simeon. "Lord, now lettest thou thy servant depart in peace, according to thy word. For mine eyes have seen thy salvation, Which thou hast prepared before the face of all people, A LIGHT TO LIGHTEN THE GENTILES, AND THE GLORY OF THY PEOPLE ISRAEL." Also present was Anna, a prophetess "and she coming in that instant gave thanks likewise unto the Lord, and spake of him to all them that looked for redemption in Jerusalem." In the memorial are two shields the one on the left is a crown and the one on the right a lit oil lamp the symbol of wisdom. 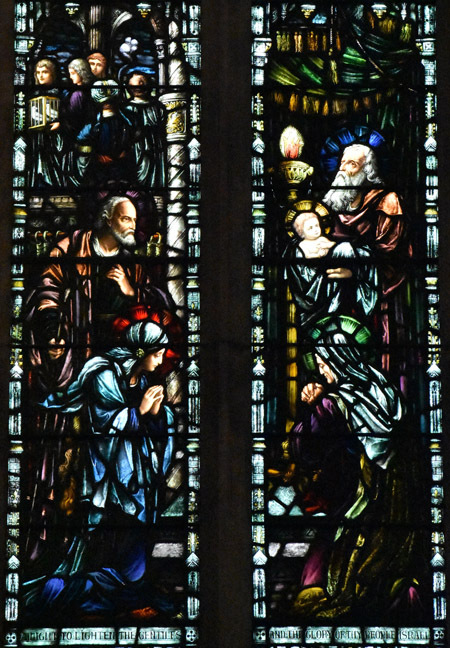 At the bottom right of the window is the signature "Heaton, Butler & Bayne".